As I noted in my Greeley Surname Saturday post, it has been noted that Captain Samuel Greele died by the fall of a tree. In exploring Find A Grave for Greele / Greeley ancestor memorials, I found memorials for Captain Samuel Greele and his wife Olive (Read) Greele, as well as their son, Major Samuel Greeley, who are all buried in Vale End Cemetery in Wilton, New Hampshire. 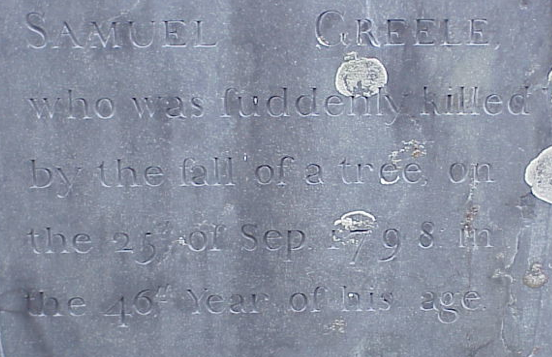 Do visit Samuel Greele's Find A Grave Memorial, where photographers have shared wonderful photographs of not only his stone, but a monument with a notation by the photographer that "This marker is at the spot where he died when a tree fell on him and his horse." In addition, his gravestone notes his cause of death as well. the 46th year of his age. Isn't Find A Grave a wonderful site/service? It makes you realize how many good people there are out there, who are willing to take photos of tombstones for strangers for nothing. Karen, yes, I love Find A Grave and try to get out to fulfill photo requests whenever I can so I can pay it forward!